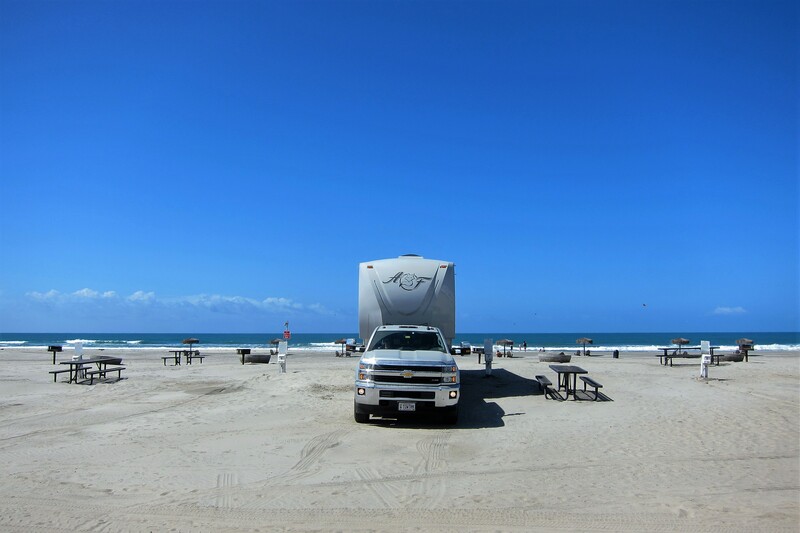 Wednesday, March 30, 2016: Over the last couple of days, Del Mar Beach RV Resort in Oceanside, California has morphed into a nearly deserted campground. Spring break in Southern California is over and all the poor souls that need to return to work and/or school have done so. 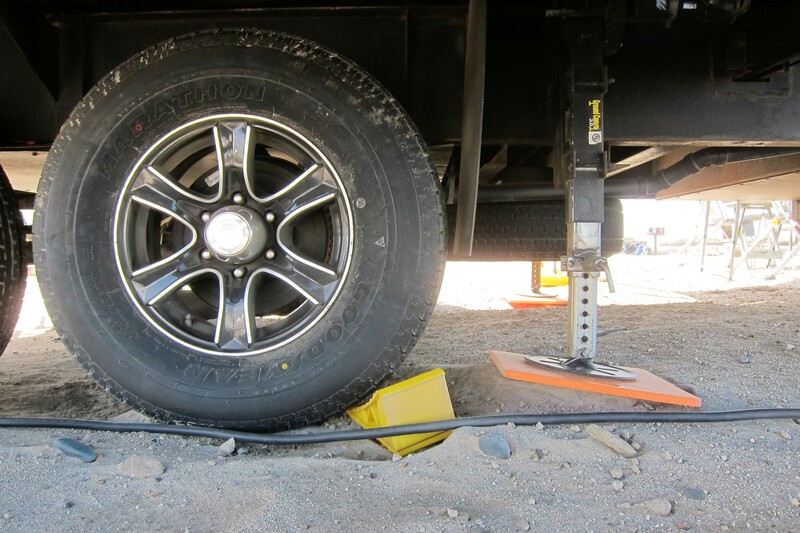 Overnight, the wind picked up off the ocean and the shifting sands has eroded the support used by the camper’s jack pad’s and chocks. The camper bounced about a bit, however, as far as I can tell, didn’t move from its position. All four tires, and all the leveling jack pads suffered severe erosion…so much so that there was just a small contact patch remaining!?!? Following a lazy morning of re-leveling the camper, downloading photos, catching up on correspondence, and working on the journal, Kit and I departed our oceanfront campsite at 1115 and headed North. 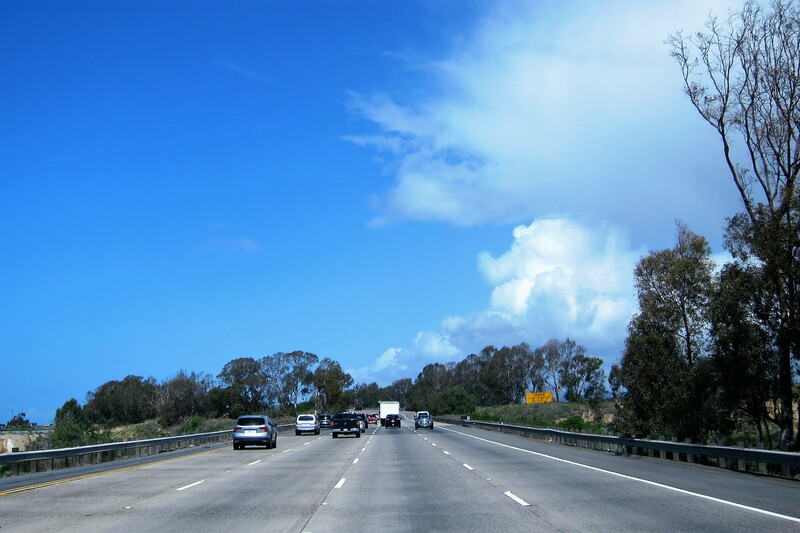 We didn’t travel far before reaching our next destination…one we haven’t spent much time in over the years, the Seal Beach/Long Beach area just south of Los Angeles. At 1310, we pulled into the Naval Weapons Station at Seal Beach and set up in their very nice campground. One administrative note that I should mention, we just purchased a new laptop and installed Windows 360 so if the blog looks different that is the reason. Our six-year-old laptops were still functionally working, however following the conversion to Windows 10, and the application updates that resulted, the processor which wasn’t very fast to begin with, slowed down dramatically. In addition, the power supply’s cooling fan was starting to make noises like I do first thing in the morning…not good! After a nice light meal followed by a session in the camping chairs with cocktails in hand while we enjoyed the warm spring evening it was off to bed. Thursday, March 31 through Sunday, April 3, 2016-Seal Beach, California: Kit and I spent the three days in Seal Beach exploring and enjoying some of the sights. One day, while driving through neighboring Long Beach, we came to this interesting modification to a city street. Yep, those are race car tires stacked to our left. 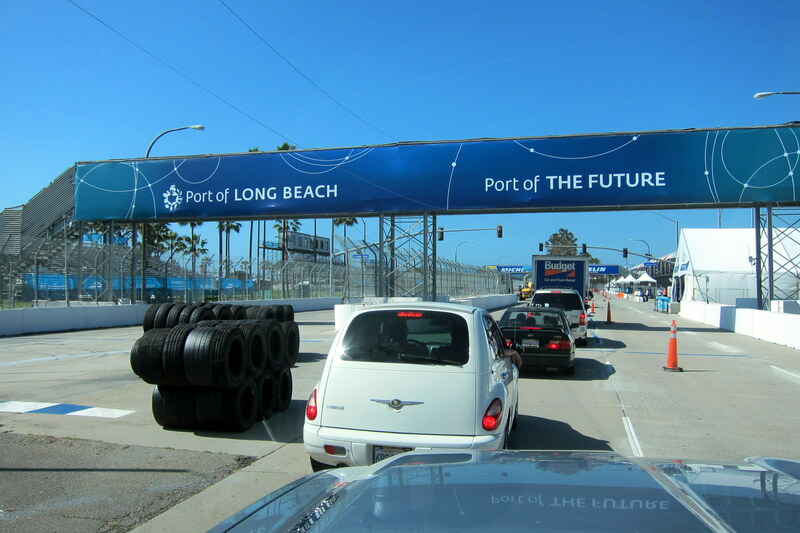 Knowing that Long Beach was renowned for one of the venues of the Grand Prix race circuit, I thought they may be setting up for that…but it seemed a bit early in the season. Then, a short distance further down, the street converted to a race track, we came across this unusual looking vehicle. That folks, is an all-electric race car that competes in Formula E. This relatively new form of auto racing precedes the Long Beach Grand Prix by a week and features high performance racing machines that run solely on electric motors. 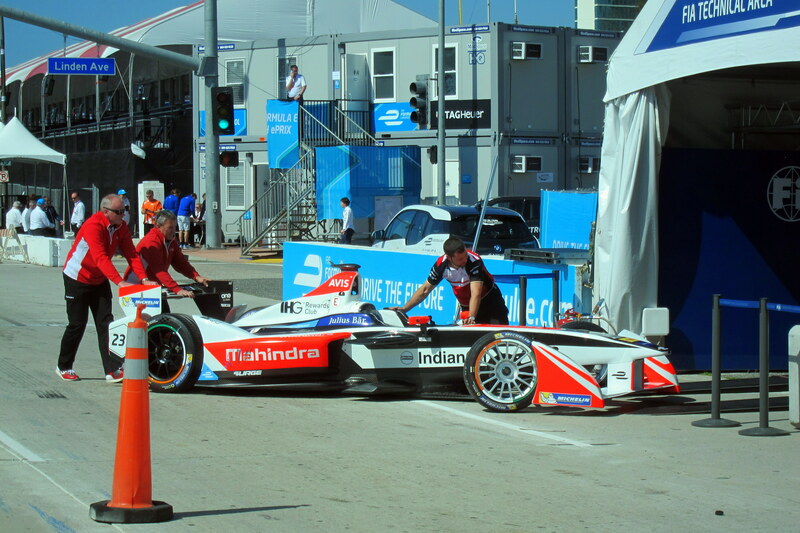 Pit stops in Formula E are unique as instead of taking on fuel, changing tires and making suspension adjustments, the drivers simply step out of the battery depleted car, and right into a fresh one! The zero to sixty mile per hour times are around 3 seconds, and the cars top out at 140 MPH. 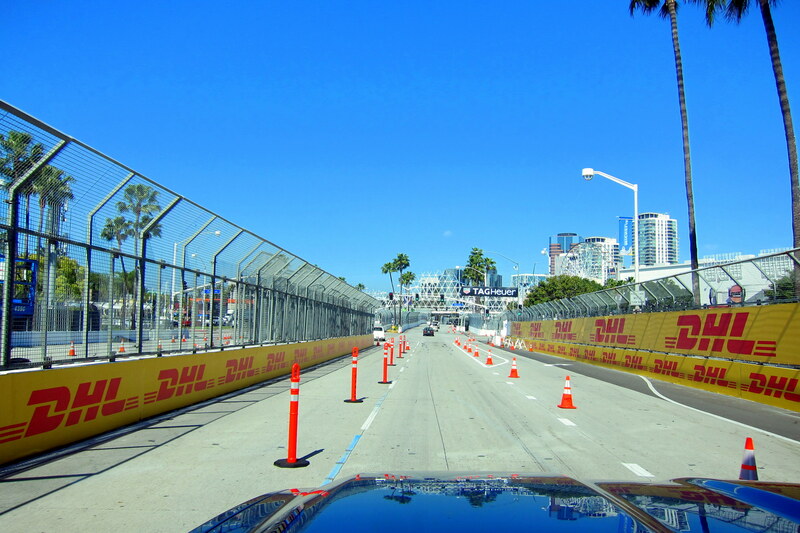 Formula E folks race on the same track built on the host cities streets as the Grand Prix folks do. As I continued down the main drag (pun intended) of Long Beach I had an uncontrollable urge to let our one-ton diesel rip! 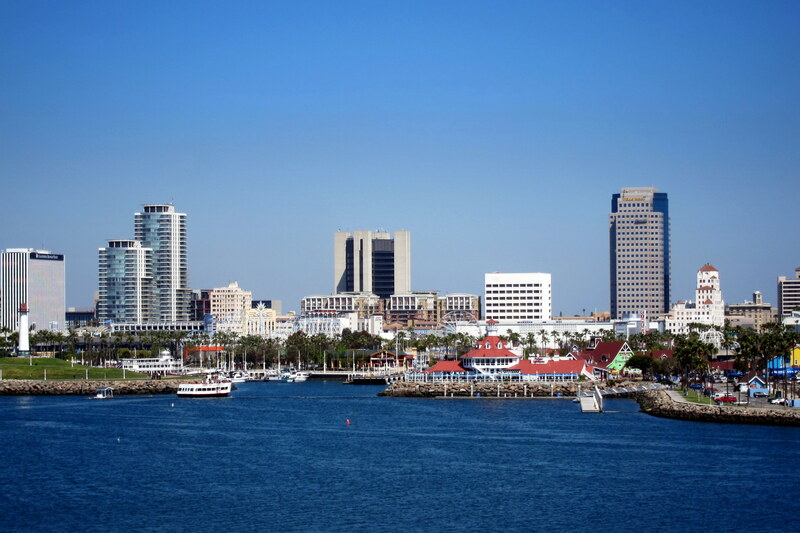 Long Beach used to be the home of a Naval Shipyard where my San Diego based tin-can underwent a baseline overhaul before being deployed to the Far East. The shipyard is gone…it has been turned into a huge containership port and is also the current home of this grand old British lady. The Queen Mary sailed the Atlantic primarily between Southampton, England and New York City for close to thirty years, and for over half that time she was the fastest ocean liner afloat. 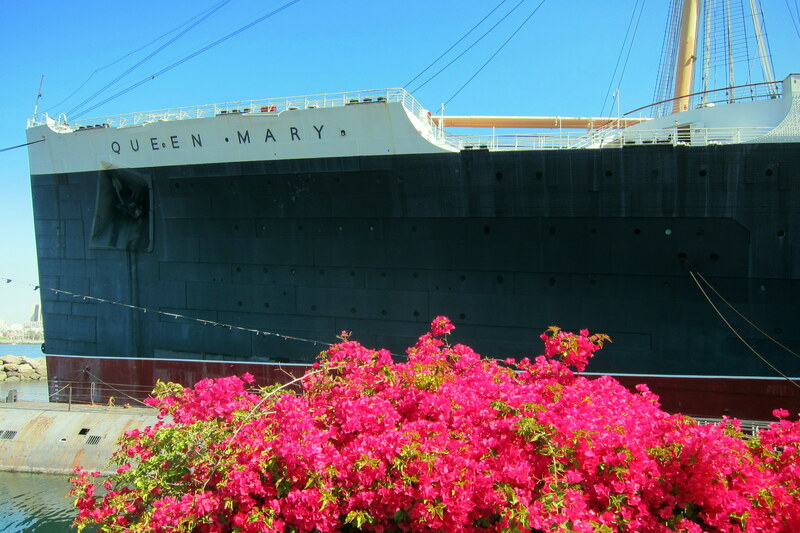 Originally, the Queen Mary was to be named Victoria after an earlier monarch…however during construction, and following a depression era government bailout, the name was changed at the urging of the King George V to honor his wife, the current Queen of England. Along with her sister ship, the Queen Elizabeth, the Queen Mary served during World War II as an allied troop transport. Being painted haze grey, and faster than the German U-boats, she became known as “The Grey Ghost”. Although built to carry 2,800 passengers and crew during peacetime, the Queen Mary in 1942 ferried 16,028 American servicemen to the European Theater…a record for personnel transport by ocean that stands to this day. Following the war, these two British ships were the most popular vessels for transoceanic travel until the jet age when both were retired. 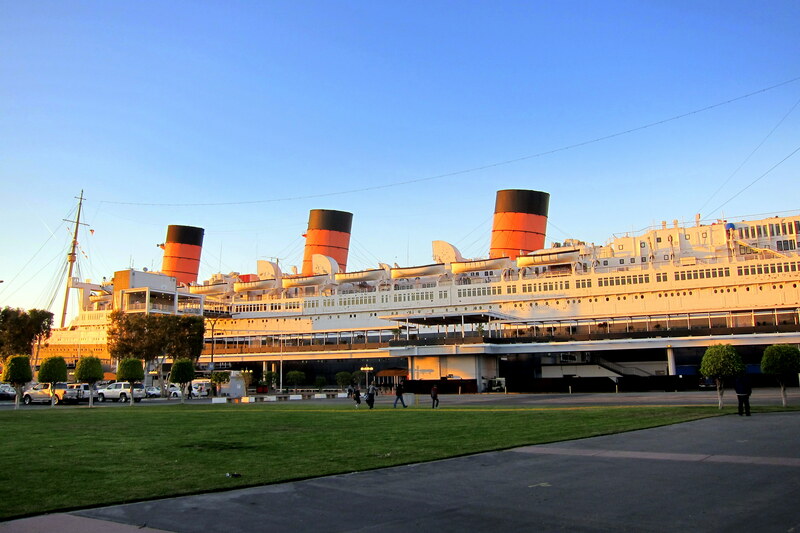 The Port of Long Beach outbid a Japanese scrap merchant and acquired the Queen Mary for $1,200,000.00 after which she steamed to California where she was converted into her current state as a floating hotel, restaurant and museum complex. Currently, there is a special exhibit featured onboard which Kit and I thoroughly enjoyed. 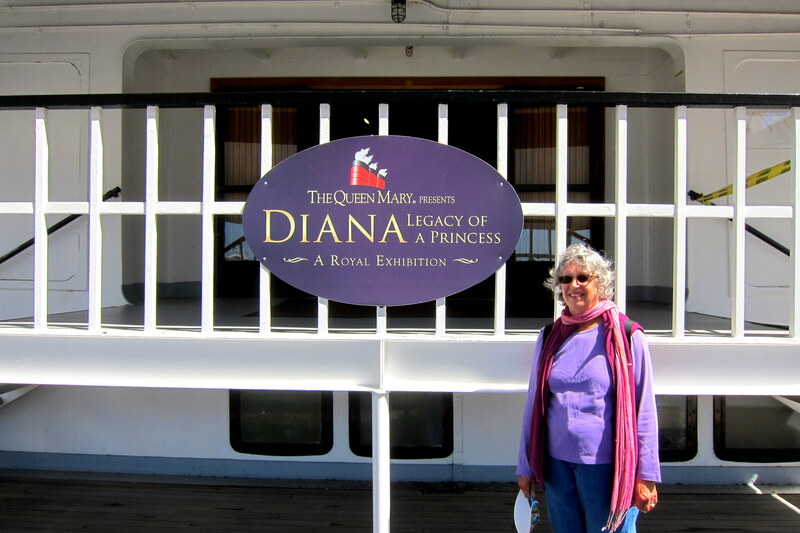 In addition to a very nice tribute to Diana, including a number of her personal items being on display, there was a chronological history of the British Monarchy which was interesting as well. As in many modern tours, a portable audio device is available that provides for self-guided tours where one hears, by using the supplied headset, information about the various areas of the ship such as the bridge. 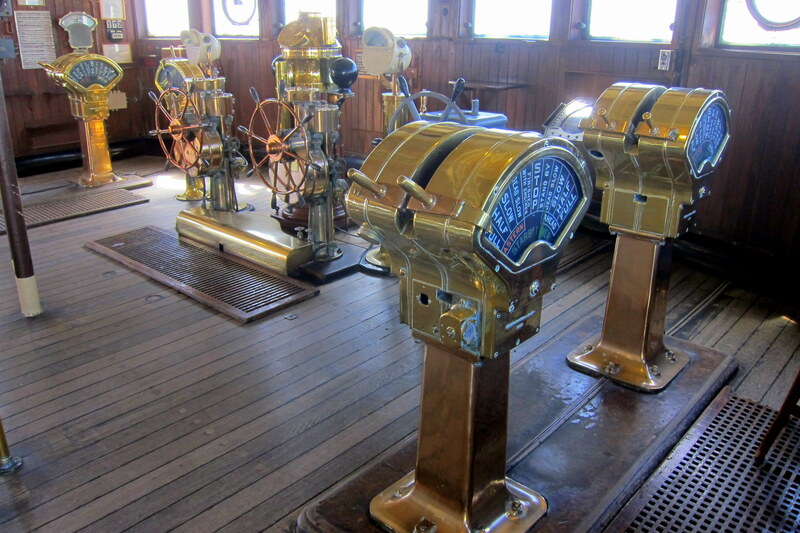 This space, also known as a pilot house, contains the helm where the ship is steered and the lee-helm where engine orders are issued to control ships speed. 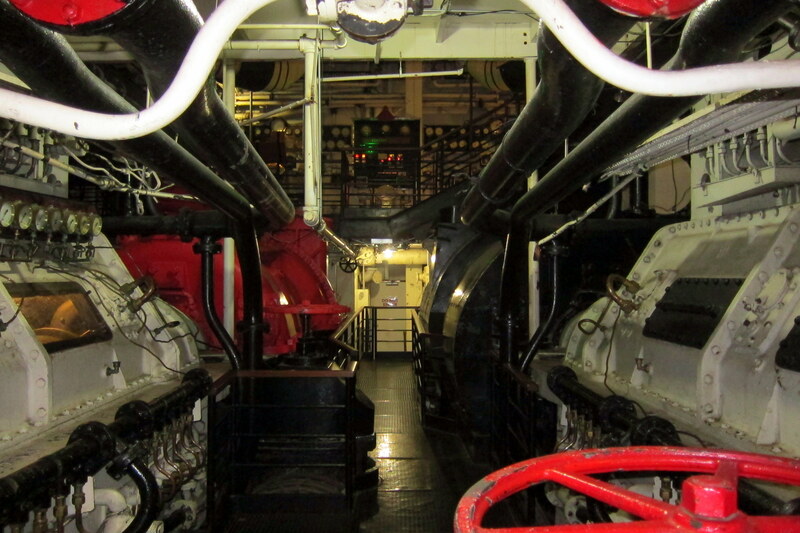 The tour also takes folks to the engineering spaces, where the steam turbines, reduction gear and shaft are visible. 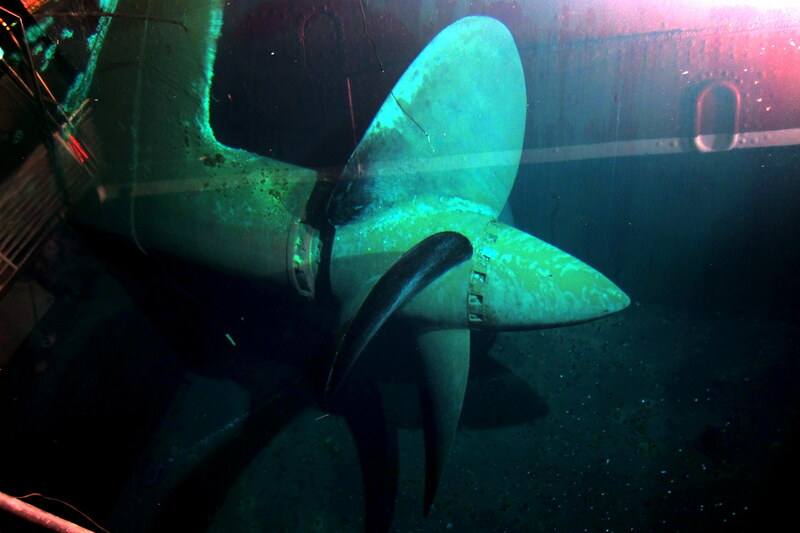 There is also one of the massive twenty foot propellers available for viewing…preserved in a unique fresh water filled enclosure welded to the side of the ship! 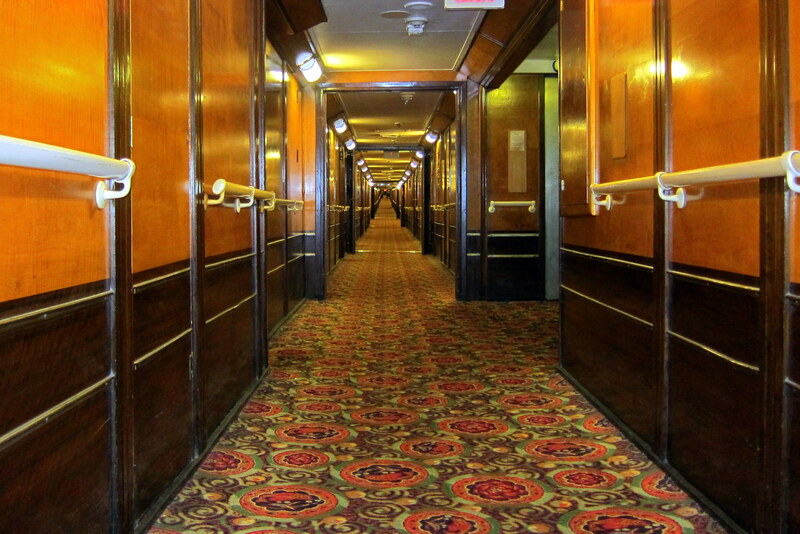 The tour also leads through the passageways housing the passenger compartments which are available for overnight stays. 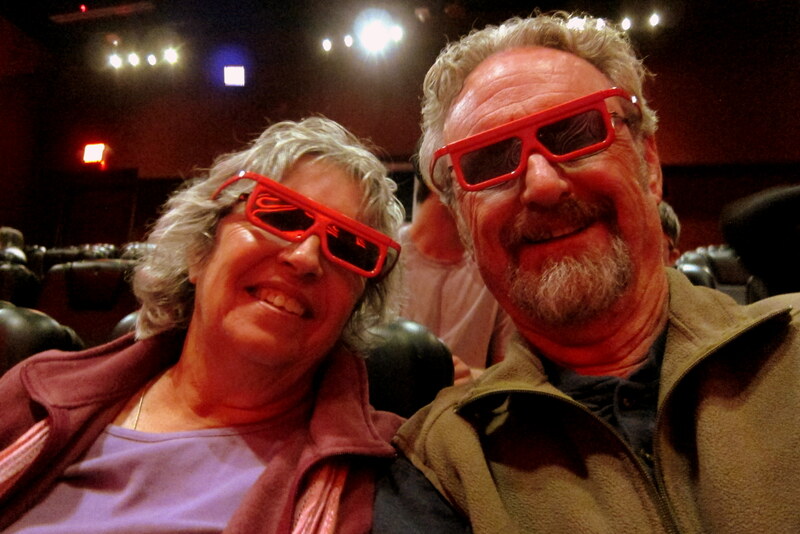 In the stern, is a 4D theater shows various films with visual, audio, sensory and physical effects that are timed to enhance the film…and you get to wear some really hip looking eyewear to boot! 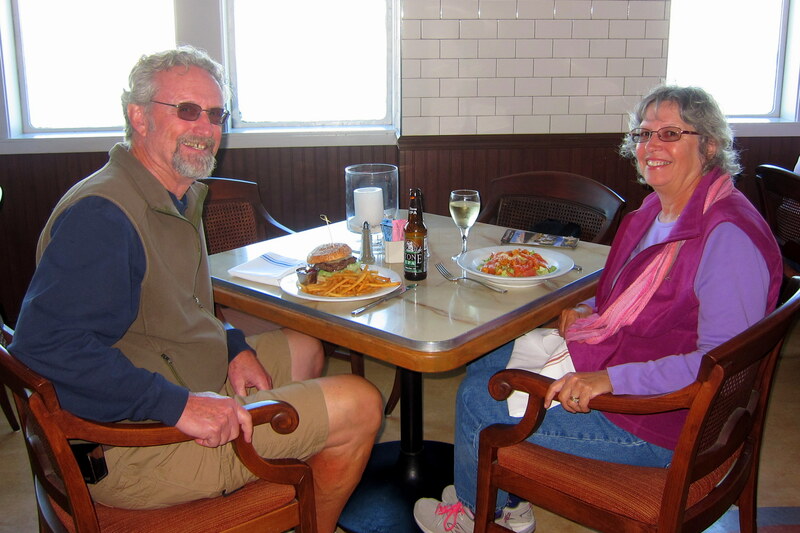 For a late lunch, Kit and I decided to dine onboard and selected the Chelsea Chowder House on the main deck. 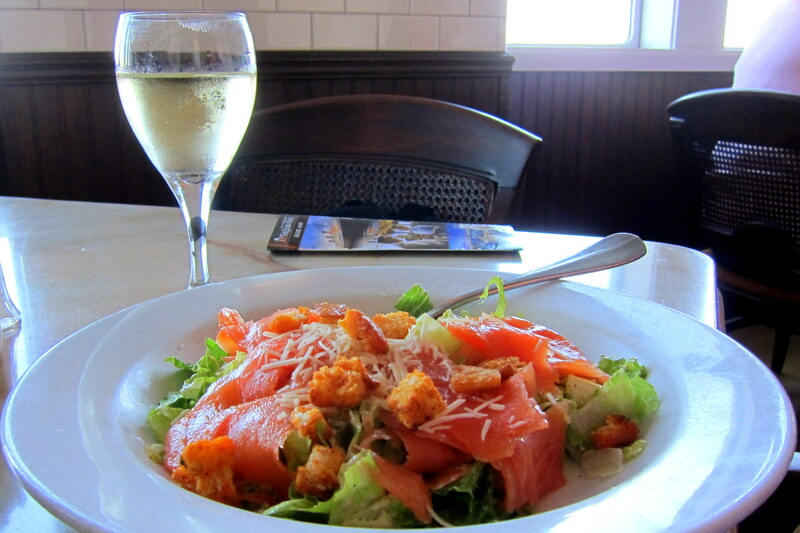 While I enjoyed a steak burger, Kit chose the Salmon Salad, which she thoroughly enjoyed. From our table, we had an excellent view of the Long Beach waterfront. Boy, has the Port of Long Beach changed since I was here last! Following a great day, Kit and I returned to the campsite and enjoyed snacks under the awning while watching the sun drop into the western horizon. Tomorrow we officially start heading home as we will finally point our rig into the rising sun! Monday, April 4, 2016: Up and on the road by mid-morning. Kit and I wound our way through the city streets of Seal Beach while contending with LA influenced traffic until we merge onto I-15N as the traffic moderated. Our return path from these winter escapes have taken many different forms. Sometimes we stay far south and travel either I-10 or US-90 until we hit the Atlantic Ocean where we head up the coast toward home. In other years we choose I-40 and travel through the Midwest, then meander up the Blue Ridge Parkway. Then there are times where I-70 through the Rocky Mountains and the Kansas plains toward points east is our route. Or, sometimes we select I-80 out of Salt Lake City, drive through the upper Midwest, then move into Canada for the return trip. And if we find ourselves in the Pacific Northwest, we will hop on I-90/I-94 and sail through Montana, the Dakota’s and head into Canada from there. 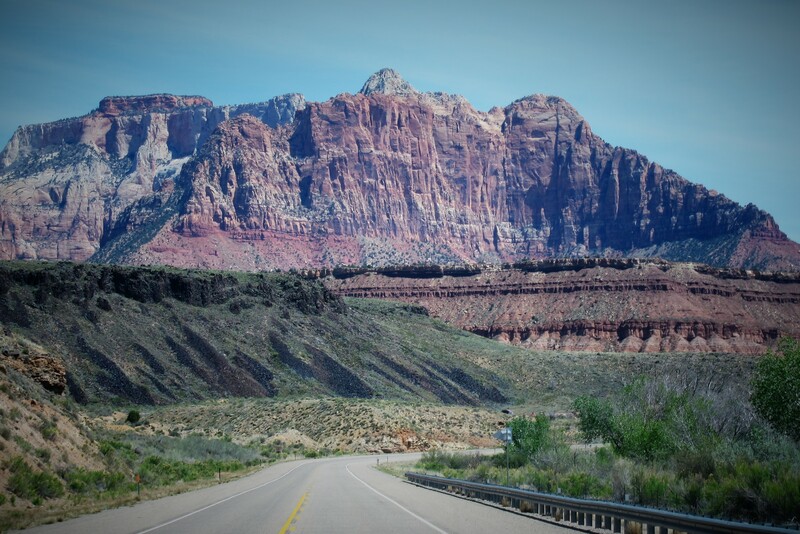 However, last night we had a discussion and decided we wanted to spend time in Southern Utah, an area we haven’t been in for a few years. So, I-15 through Las Vegas toward Springdale, Utah is our current path…and guess who lives in Vegas baby? Yep, grandkids!! 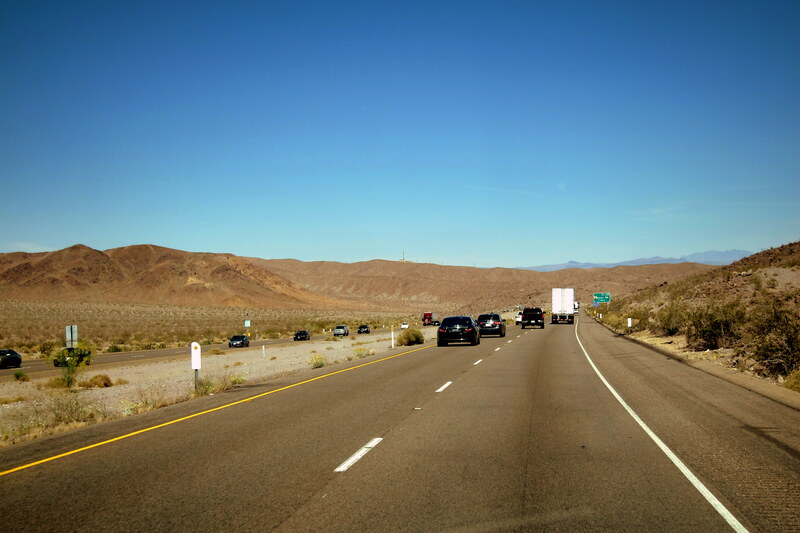 As the day wore on, we bisected the Mojave Desert and the temperature rose correspondingly. 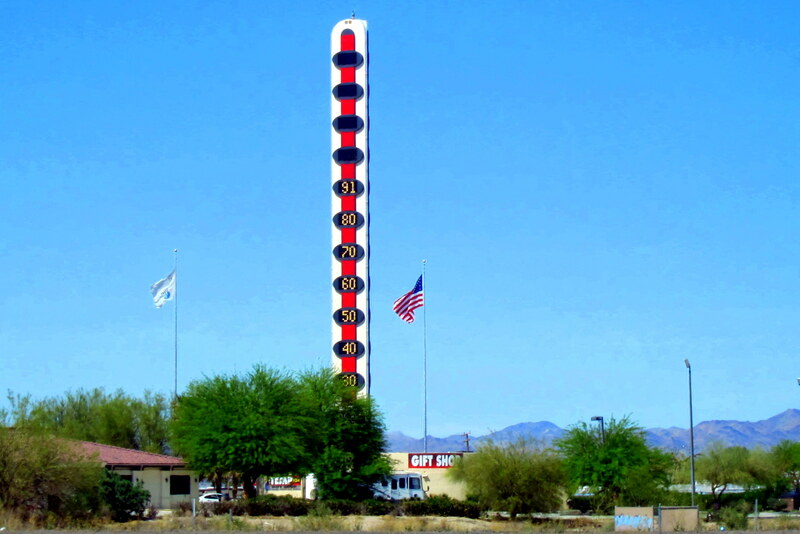 Passing through Barstow, Kit noticed a reading of 91 degrees on the huge roadside thermometer the town is so proud of. Well, as the saying goes: “If you can’t stand the heat, get out of Barstow”! So we did. We crossed the border into Nevada at 1520 and just outside of the city of Las Vegas, we spotted this delivery truck. 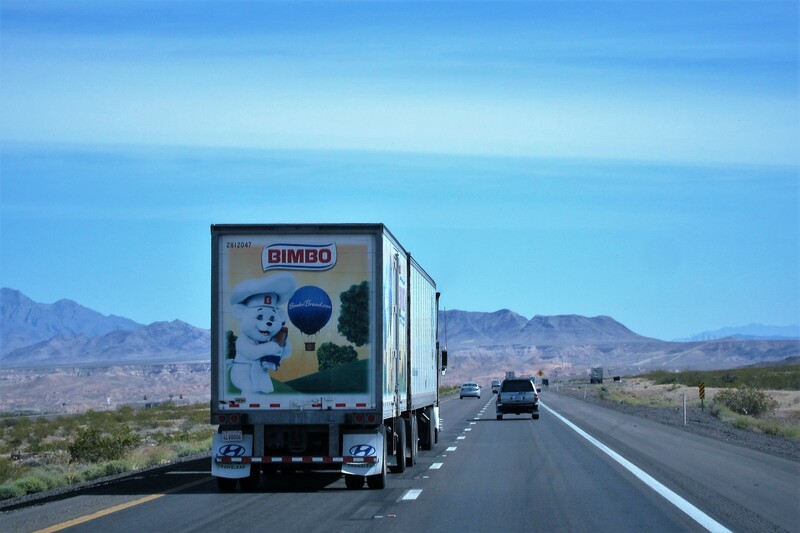 Yep, another truckload of Bimbo’s heading for the glitzy Vegas strip! 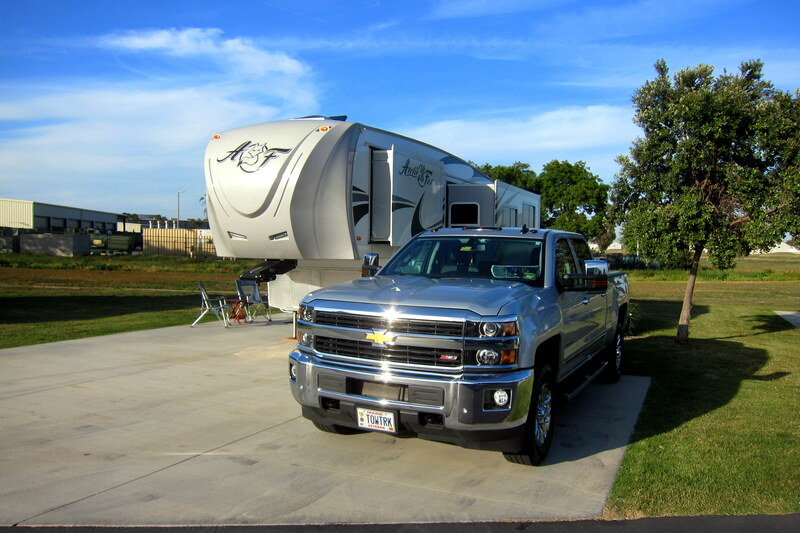 A half hour later found us pulling into Oasis RV Resort…a place we have camped many times before. Unhitching the camper, we headed to our daughter’s house with pizza’s in hand for a spontaneous drop-in visit…. boy were Jack and Tucker surprised! Since it was a warm evening, we enjoyed the meal on their patio. Followed by birthday cupcakes which were good, but got a bit messy! 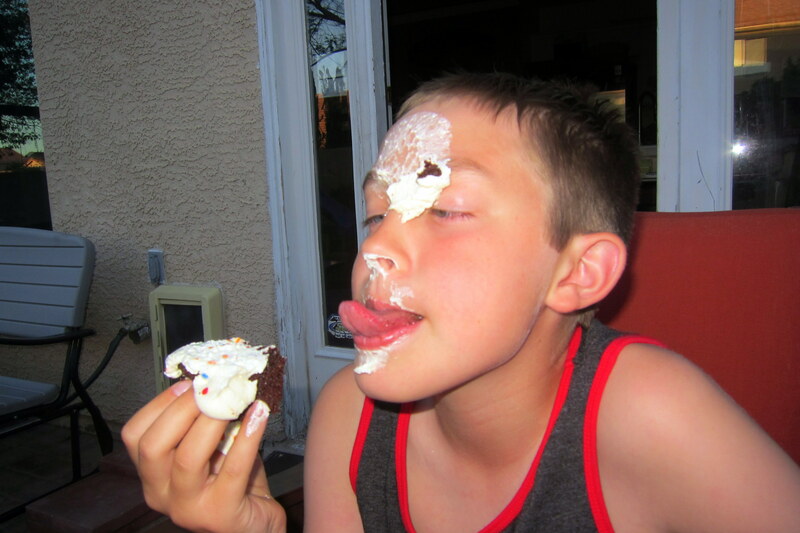 Since it was a school night, we left early and arranged to host the boys at the campground tomorrow afternoon. Tuesday, April 5, 2016-Las Vegas, Nevada: Kit and I spent the morning just relaxing around the park and the afternoon doing some shopping. At 1500 Kevin arrived (on his way to work) with the boy’s and a few minutes later we were in the pool! Kit prepared an excellent kid friendly dinner after which it was right back to the pool. Well, until the sun dropped and the wrinkles began to set in! At 2030, Suzie stopped (on her way home from work) to pick up the boys, so we reluctantly said our goodbyes. 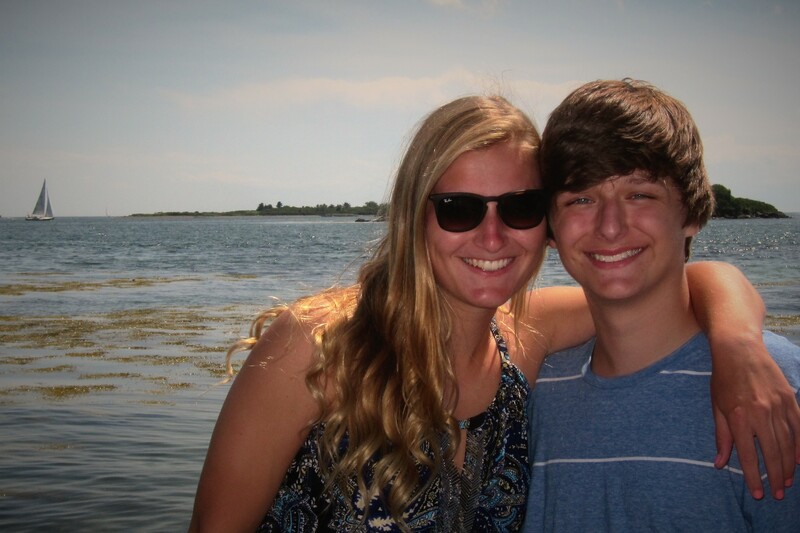 This had been an unplanned but very pleasant layover but tomorrow Kit and I must continue heading east as we are anxious to see our three Maine grandchildren which include Joe, age 23 and his longtime girlfriend Abby, age 22. 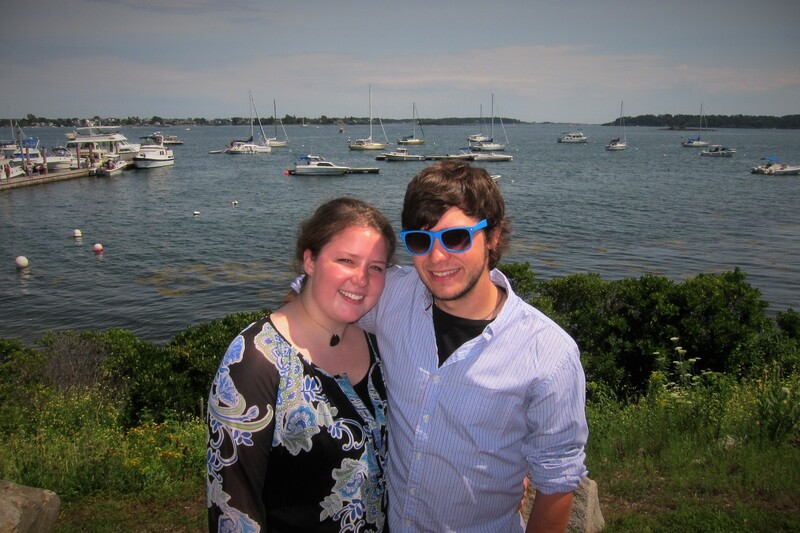 Also Katie, age 20 and her brother Chris, age 16. As much as Kit and I love traveling about the country for six months straight, we sure do miss family back home. Can’t wait to see you guys…love you! Wednesday, April 6, 2016: Up fairly early and on the road toward the east. 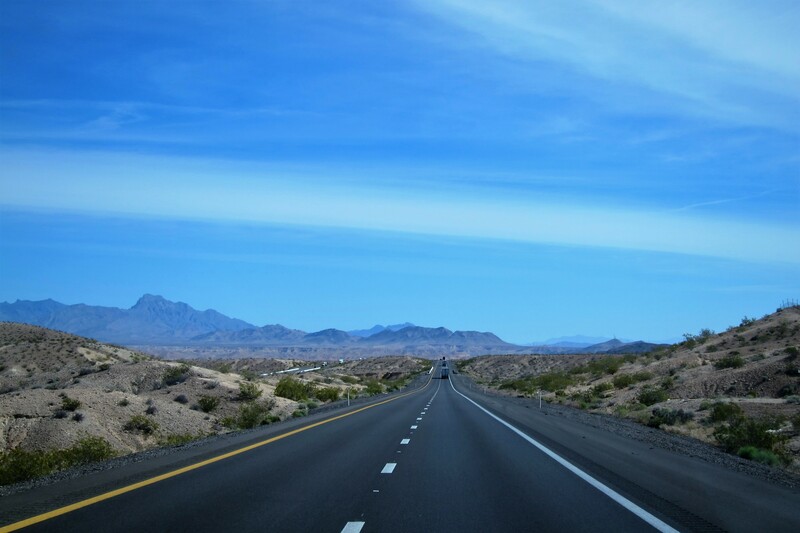 We clipped a corner of Arizona before crossing the Utah border at 1120 and entering the Mountain Time Zone…Yikes, we just lost an hour!?!? This could be an issue as we want to camp at Zion National Park for a few days, and the campground is first come first served, so the earlier we arrive the better chance we have of bagging a campsite. We thought we were making pretty good time and the GPS had us at the park’s entrance at 1200…then came the change to Standard Mountain Time, and the loss of that advantage, rut-ro! Veering off I-15 onto UT-9 we headed into the mountains and started noticing the iconic red rock formations of Southern Utah. Driving through the gateway town of Springdale, Kit and I waited patiently in line to enter the park. Flashing our old folks cards, we headed to the campground where Kit spotted a sign that read “Campground Full”! However, a small piece of paper attached to the sign said that site #9 and #28 may be available soon. Without even stopping, we drove in and found site #28 empty. As we were backing in, another camper stopped to check it out…we had just barely made it in time! Road magic strikes once again!! 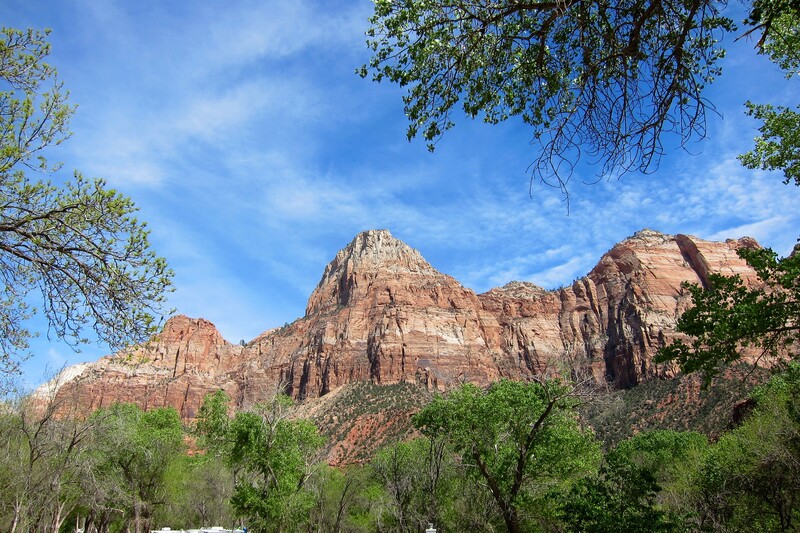 Today marks the third time we have checked Zion off our bucket list…can you tell it’s one of our favorite National Parks? Can you also tell why? 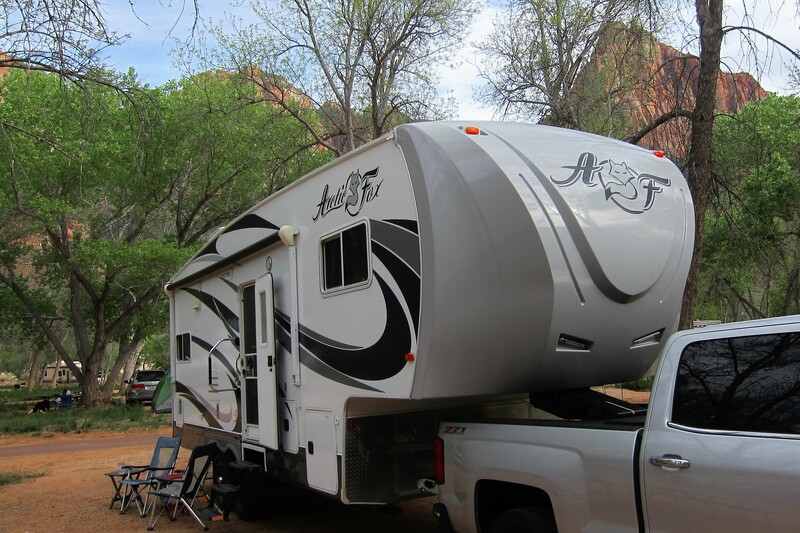 Please look for the next episode of Bill and Kit’s Excellent Adventure…Camping in Paradise. But first, a few additional items to fill out the rest of this chapter. As mentioned in the past, Kit keeps a pretty detailed record of our travels in a spiral notebook. Then, when the mood strikes me, I’ll take those notes and write the Journal. We use a new notebook every year as it fills up fast…there are lots of detailed notes about various campgrounds, points of interest, shopping lists, random thoughts, etc. etc. contained on the pages. Below is this year’s notebook. This is my favorite notebook so far! 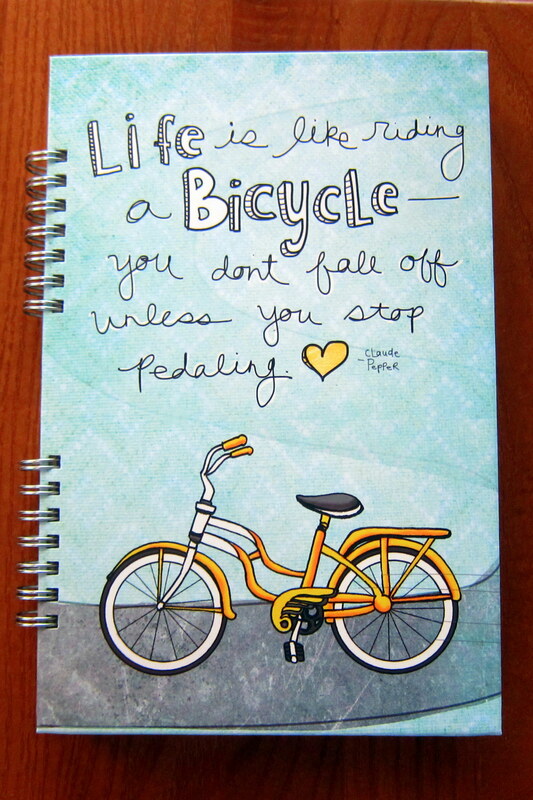 For one, I like all things bicycling, and for another, I love the sentiment in the quote! Well, since I still have a little space remaining in my self-imposed journal length, here is some information on a new truck gadget we acquired a while back. 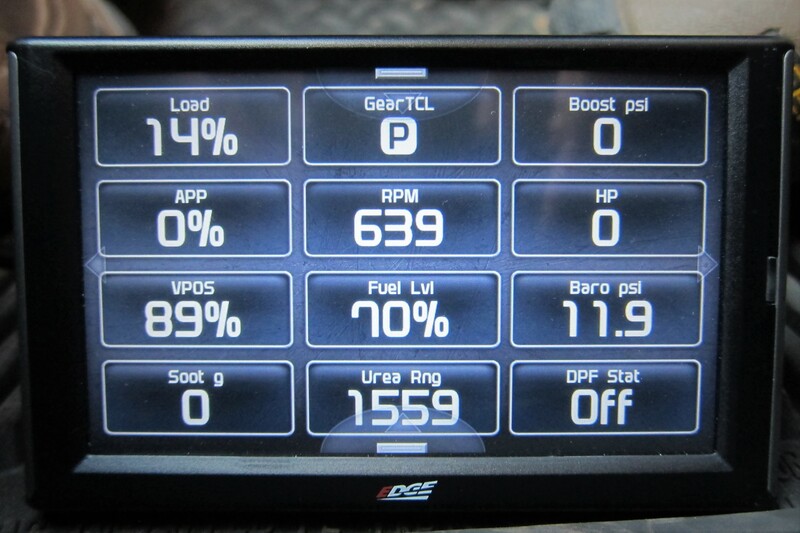 It’s an in-cab monitor that displays various engine parameters. The device plugs into the OBDII port and features customizable screens and display options. Most modern engines constantly run diagnostic checks as we merrily drive along. Then if something is out of specifications, or fails, a warning light will illuminate on the dash. With this monitor, the driver receives a constant readout of the engines health. I like that…I’m funny that way! Well, actually, I’m funny in a lot of ways!! That last paragraph hit the twenty page mark according to MS Word, so that we will brings this episode to a close. Kit and I are really looking forward to the next few days in one of our favorite National Parks…stay tuned! I especially loved this one for so many reasons…Long Beach (gotta go there); the Queen Mary (OMG…would love to spend a night on that!). 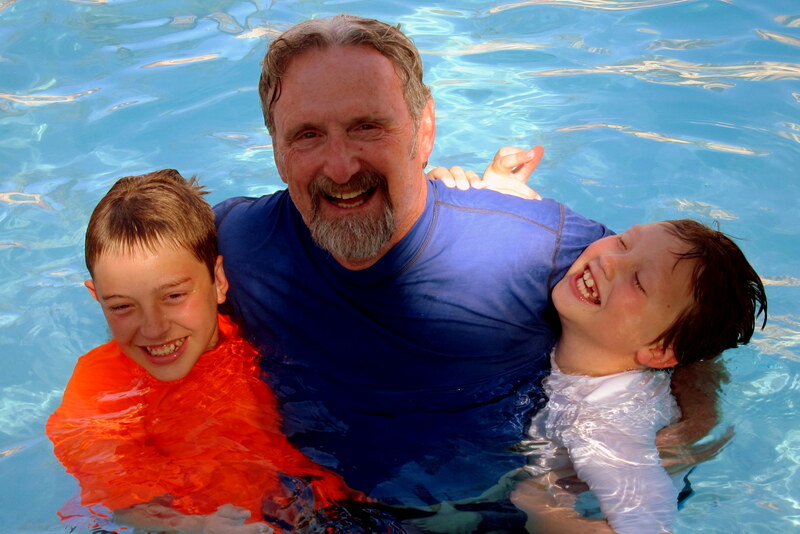 The pic of you with the grandkids in pool is frameworthy….well I think all of your pics are anyway. Loved your annual notebook. I’m tellin’ you….there is a book in your future..actually more than one! 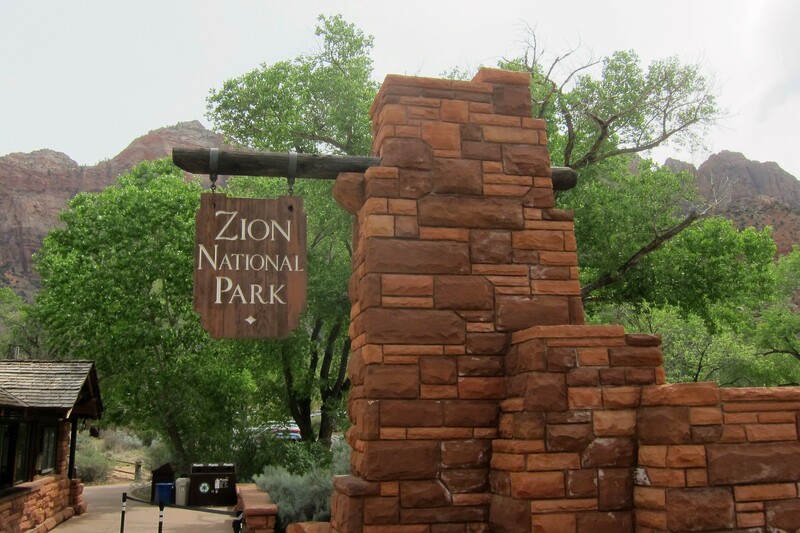 Loved Zion…gotta go there too. And it is nice to know that you can still have blowups after so many years together and enjoy being with each other so much!!! Another their informative blog. 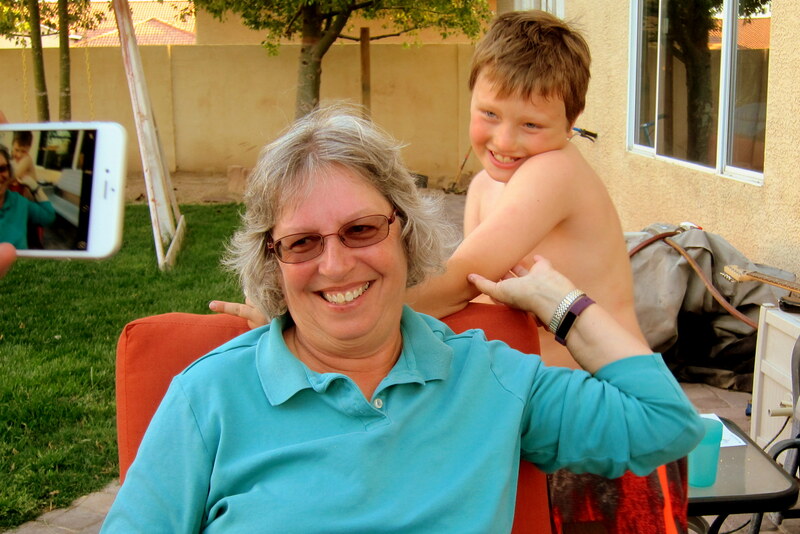 I so enjoy your joy and of grandkids and each other. Yes, Kit I am nervous about being bound at least he hip next winter. GOOD TO HEAR THAT YOU’RE HEADING EAST. GREAT WEATHER AWAITING YOUR RETURN. HAVING DIN DIN WITH THE MONACOS AND LANGSTONS AT TUSCANY THIS EVENING. JEANNE RECOVERING AFTER HER BOUT WITH A KIDNEY STONE REMOVAL!! Queen Mary was the grandmother of the present Queen Elizabeth.Their oldest son stepped down from the throne to marry Wallis Simpson, which left #2 son, George as King. Loved the road scenery! BTW, Ray & Darlene left TX yesterday to head to Maine. It will be great to see all of our snow-bird friends again! Safe travels. We’re loading up for the trip home and going out to dinner with just about everyone we know. So much for eating up all of the food in the fridge and freezer! At least we have a friend who will take what’s left. Different than when we spent our winters in a motor home! See you in the northeast corner of the country soon! You folks are getting to tour those magnificent Utah National parks…we had planned to do that, but had to cancel. We are now at home in Bend…dealing with very cold weather. 22 degrees Monday night after we arrived…a shock after a 98 degree temp at Yuma sent us running north! Great travelogue…and you two are amassing a good many memories to chuckle over when your years of travel come to an end! 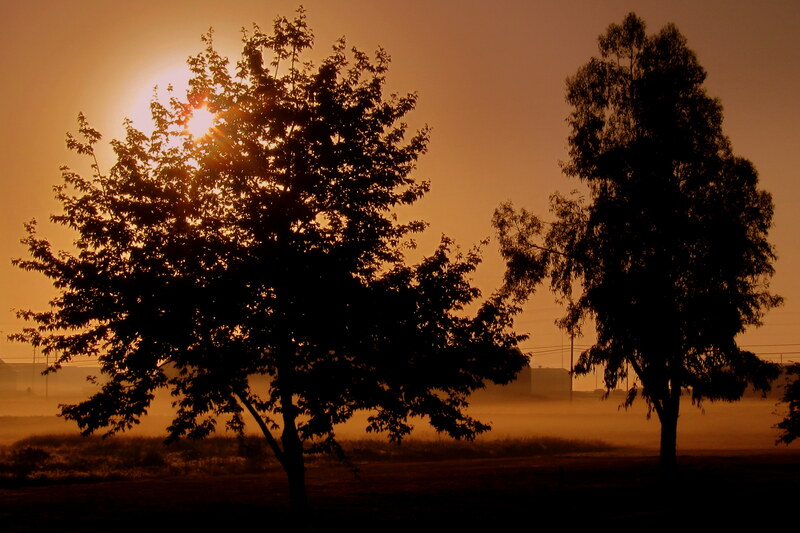 Take Care, travel safe….